Besides being easy, quick and inexpensive to make, minimum space layouts are often a lot of fun to operate. 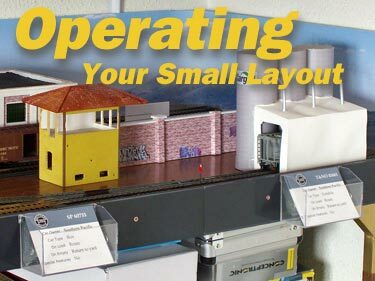 It’s a well-kept secret that the techniques for running a model railroad can apply just as well to very small layouts as they do to large, $15,000 basement-fillers. 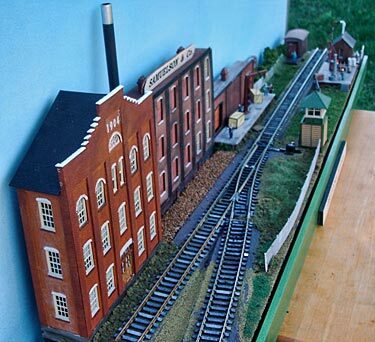 This page is dedicated to showing you some ways to enjoy “playing” with your micro layout! I think there’s a negative mythology afloat in the model railroading world that discounts small layouts as “boring and useless.” These myths are completely false! It’s time to puncture them and throw them away. So another purpose of this page is to deflate the myths and get rid of them, once and for all. Minimum space layouts are one heck of a lot of fun. Let’s kick back and enjoy them! Here are the misconceptions (or “myth”-conceptions) that bug me the most. They all deal with operating your small layout (if you wish to do so). Small layouts are too simple to be any fun. Most small layouts are just switching puzzles. 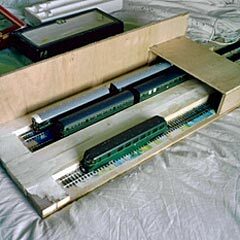 Small layouts can’t be operated like the prototype. ‘TUNING FORK’ LAYOUTS CAN REALLY HUM! A “tuning fork” layout has one turnout (track switch) that divides the running line into two branches. Chris Ellis gave it the name because it resembles such a fork (at left). 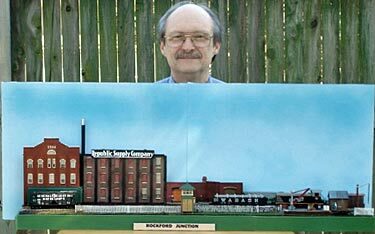 Chris is the editor of Model Trains International, arguably the best small-layout magazine in the world. He declared, “The ‘tuning fork’ is the smallest possible layout that provides opportunities for railroad-like shunting operations.” We have a couple layouts in this issue (below) that demonstrate Chris’s point. Prof Klyzlr, from Sydney, Australia, agrees. Prof declared, “The trick is to stop thinking of it as a modeling display and start thinking about it as a portion of a real railroad. For example, suppose one ‘leg’ is the main line and the other is an industry—a typical prototype situation. The industry track will have several defined ‘car spots’ where cars may be loaded or unloaded. “This could be as simple as ‘the industry has a warehouse with three doors: the boxcar goes to Door 1, the tankcar to Door 2, and the gondola to Door 3.’ These moves could be somewhat complicated, depending on the sequence of the cars the loco is hauling. To check out a prototype tuning fork, see John Bruce’s tour of Cranbury Station, New Jersey USA in Scrapbook #82. For some more eye-opening examples of prototype switching at forked tracks, still with only one turnout, see the amazing blog of Jack Hill, from Enola, Pennsylvania. Scroll down to “Stretching a Simple Spur” and “Proto-Examples” to see several pretty involved real-life switching jobs on tuning-fork track arrangements. And finally, here are two excellent model examples (below). Jim Ronda, from Tulsa, Oklahoma USA (shown at left revealing the depth of his little layout) describes his concept this way: “I wanted to build something that was no more than six inches wide and three feet long. It needed to have locations that could provide interesting settings for my British GWR locomotives and rolling stock and my American equipment. It had to have good operation potential. 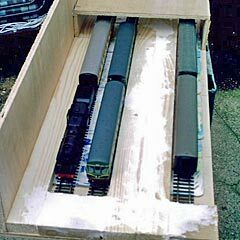 And it could have no more than one turnout; no traverser and no fiddle yard! The obvious answer was the Tuning Fork.” He got the original plan from Chris Ellis’s book, Next Steps in Railway Modelling (page 30). 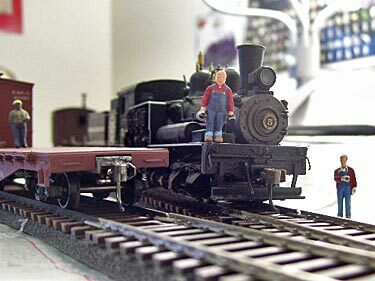 John Gardiner IV, from Provo, Utah, USA, is a teen-age model railroader. 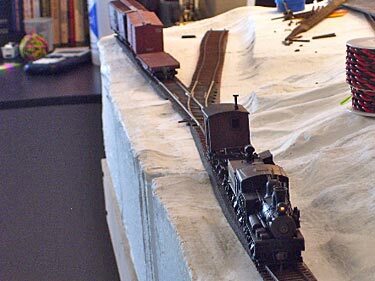 He moved to Utah last fall, brought along his plans for a 3x9ft HO layout, negotiated space for it, and began work. Then a strange thing happened. The moral: if you think about them carefully, even very simple layouts can be a lot of fun to operate! [NOTE FROM CARL: I received an e-mail recently from Gary Miller, who lives in Livonia, Michigan USA. He’s exploring small layouts and has built a combined Timesaver/Inglenook on a 48x18in (120x45cm) shelf; now he’s looking at the Switchman’s Nightmare layout (found in our Classic Layouts honor roll). He was asking me what the initial car positions and “rules of the game” are for this layout, because they’re not listed anywhere on the internet. Switchman’s Nightmare is a genuine railroad layout… It is a compressed version of prototypical trackage, and can be operated like a real railroad in almost any way you choose… You can apply to this layout any or all of the multitude of Operating Systems available. 1. Identify the purposes of the tracks on the layout. In the case of Switchman’s Nightmare, you appear to have two yards for sorting cars—Eastbound (Alpha) and Westbound (Beta), as well as a small industrial switching district (modeled in low relief along the back). 2. Figure out what kind of traffic you’re going to run. In this case, you’ll have arriving freight trains and departing freight trains, as well as intra-yard transfer runs and a local switching turn. That’s four kinds of trains you’ll be able to make up and dispatch. 3. Set up your CRS (Car Routing System). There’s an example in the next section (Patagonia Yard), and there are a great many others — do some research. Try searching online for “model railroad car routing system,” and any other combination of words that makes sense to you. 4. As part of the CRS, you will need to select a destination (or series of logical destinations) for each car. The list can include: Eastbound Yard – Track #1 (Arrival), Eastbound Yard – Track #2 (Departure), the same pair of tracks for the Westbound Yard, and a listing for each industry found in the Switching District (there’s room back there for four or more customers—two alongside The Trap and at least two more to the right of the turnout). By now, another train has probably arrived at the Westbound yard arrival track… and you go through the same process with it. At this point, things are getting crowded and possibly clogged, so it’s time to send a train out on the road (away from the yards). Collect the cars from one of the departure tracks, attach a loco, tack on a caboose (if that’s your era), blow the whistle, and depart (i.e., remove the cars and loco from the tracks). You can get a lot more formal than this if you wish (schedule train departure times in advance, use “situation cards” to create various diversions like “loco drops a rod in transfer track; wrecking train needed,” etc.). 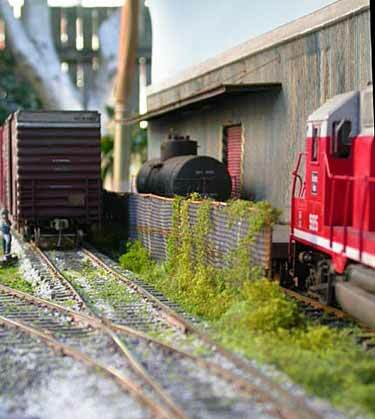 There are lots of other ways to view your trackage, too… for another approach, you might check out Scot Osterweil’s classic switching layout, Highland Terminal, elsewhere on this site. You’re only limited by your imagination! 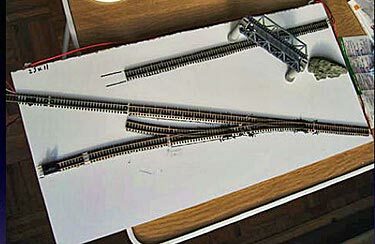 One possible improvement might be to put a fiddle yard (perhaps a 24-to-36-inch cassette) on the right hand side, connected to the Alpha Yard lead track. That way, trains can actually depart from the layout and be removed by putting the cassette on a shelf and connecting a replacement cassette, loaded with new cars (or by emptying the first cassette and refilling it with new cars). This configuration is shown below, attached to another drawing of Switchman’s Nightmare using Peco Code 83 trackage and #5 switches. All operating systems have two main parts: Scheduling Trains and Routing Cars. Small Layouts, which usually model only one or two stations, have less need for Scheduling methods (although there are exceptions—see Sutton Road below). Most minimal layouts focus on Car Routing systems… ways to specify the destinations, contents, and purpose of every car on the layout as a guide to gathering, marshalling, and then distributing (switching) them to customer locations. Car Routing systems vary widely in complexity and sophistication, from Paul Boehlert’s paper-free Blindingly Obvious Car Routing (BOCR) system to basic paper (or computer) based methods, such as the widely-used system offered by Micro Mark (their instruction sheet is well worth reading). On this page, we’ve illustrated several more Car Routing systems particularly useful for tiny layouts and tried to refer you to others. Some Googling will locate still more, and we apologize if we accidentally left out your own favorite! 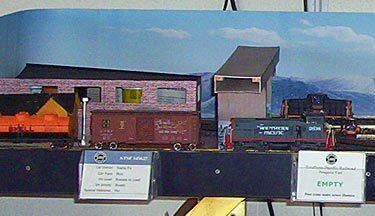 Patagonia Yard is a 130x50cm (51x21in) HO layout based on a Southern Pacific branch in Arizona USA and built by Marcelo Szkatulak, from Toledo City, Spain. It was described in Scrapbook #36. Marcelo acknowledges borrowing a number of planning ideas from this site, including using hidden sector plate and traverser tracks (plan below). The pike was designed for operation, to exchange cars among the Cargill Plant (a), Patagonia Depot (e) and The Route (Main Line), (labeled c). Marcelo describes his operating system this way. 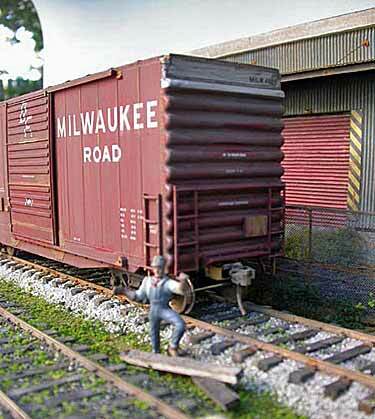 “I have several 40 foot cars (box, tanks, covered hoppers, gondolas, etc.) and little shunters to manage my operation sections. I work with two little locomotives, a GE 44 tonner and a GM SW1500. I have a card for each car in the layout (so far I have tested it running eight cars at time). Each Car Card (examples shown at lower right) lists the car number, owner´s name, car type, what movement should be made if the car is loaded or empty, and special features—some cars should not be ‘bumped,’ for example, or the cabooses need go to a ‘caboose track,’ which is an exception in the RIP track (b) for this kind of car. “I also have a lot of general Movement Cards that tell me what movement to make for a selected car (examples below). The cars can be in Patagonia Depot, in the RIP track or in the c line (also called ‘Route line’). In each movement card there are messages like ‘Empty,’ ‘Load’ or (the best of them) in red ‘COUPLER DEFECTS Go RIP TRACK’ or other troubles. [ANOTHER NOTE FROM CARL: Marcelo’s Car Routing System has all the ingredients needed, along with a few extra tricks of his own. Car Cards are a nearly universal way of keeping track of the rolling stock, and selecting cars to switch can be as easy as pulling cards from the deck. Other systems use more complicated methods, some even generate “needs” lists for the shippers on the line, requesting the type and number of cars they need during a typical week or so. You could also have your computer randomly select cars from a master list, or you could print out the list, then close your eyes and stab a few names with your finger. Marcelo’s Movement Cards determine where the car goes. There are lots of other ways to decide on destinations. For example, many systems put a list of potential destinations on the Car Card and move the car to each one in turn, keeping track by making pencil ticks on the card or sliding a paper clip down the card’s edge. Ian Holmes developed an ingenious system using dice for one of his tiny layouts. There are lots of other ways to determine what the online customers need, and how to select cars from the pool to fill those needs. The net result is a Switch List, that gives the crews on the ground their instructions for the day. How to accomplish the mission is up to them—which happens to be exactly how the real railroads do it! A key to operating realism is the “Phantom Layout” concept, which allows us to operate a slice of a real railroad, just as the full-sized roads do. The Operating Systems we’ve been discussing are tools to help us fulfill this idea. That’s the Phantom Layout concept in a nutshell… treating our small modeled scenes as functioning pieces of the whole railroad network. Here’s how Prof illustrates the idea. 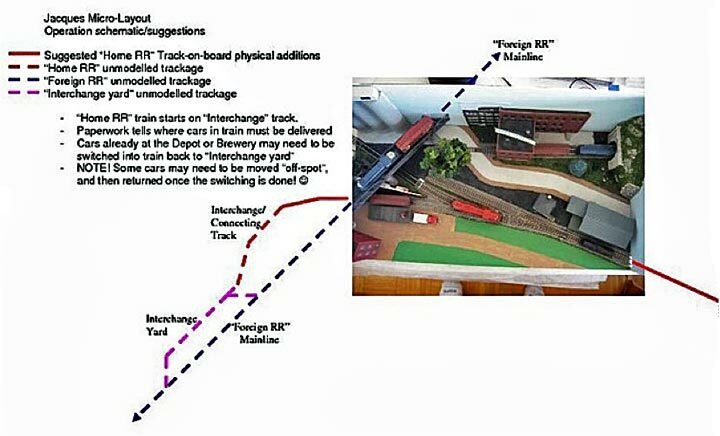 Jacques Bourdouxhe, from Quebec, Canada, posted the plan of his N-scale under-construction micro layout (right), asking how best to operate it. Prof explained, “The issue was that, when limited to the context of only the modeled track arrangement, operations quickly became repetitive, predictable, and very constrained. 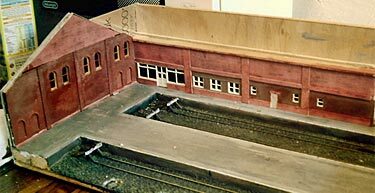 The layout itself, having only four fixed car ‘spots,’ could only host three cars at any one time, with no physically easy and prototypically plausible way for them to be swapped for other models. “A combination of some minor ‘staging track’ additions, and a mental ‘connection’ to the rest of the wider North American rail network, provided a context to open up the operations of the modelled section of layout.” The only physical change required to the layout was to extend the spur running to the left edge into an extension fiddle track added on the left. The article goes on to describe two other applications of the Phantom Layout idea… Carl’s Carnegie Car Shops and Prof’s Brooklyn: 3 AM. Often this broad-scale way of viewing your layout’s mission and purpose can provide a healthy backdrop for a busy schedule of operations. WANT TO FEATURE HIGH-SPEED LOCOS AND GLITZY EXPRESSES? A few years ago, Bob Hughes, from Sandbach, Cheshire UK, built a clever layout around the final few yards of trackage in a busy passenger terminal. The layout was called Sutton Road. It measured 4x1ft (120x30cm) and was featured in Scrapbook #67. The basic idea, pictured above, was to make the visible gap (between the end of track and an overpass view block) just slightly shorter than the length of two passenger coaches (carriages). Thus, when a pair of carriages rolled into view from beneath the overpass, they gave an uncanny imitation of the end of a 12-car express train backing into the station! Further, large express locomotives could readily be used in this setup, looking like arriving motive power attached to a single coach that imitated an entire train length (illustrated in rear track at left photo above). This illusion-based approach actually works remarkably well, and a variety of layouts designed around it can be found in our Micro Layout Design Gallery. In addition, quite a few variations of these layouts have been devised, including Evenley, by Nigel Beeton; Southwark Park, by Will Ayerst; and Prince’s Cross, by Allen Walker. Allen also created a photo sequence that illustrates the effectiveness of the illusion (included in the article on his layout). The key to operating a passenger-terminal layout is, of course, the train schedule… AKA the Timetable. 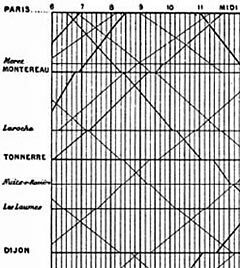 At the right is shown a portion of a French timetable of the 1880’s representing trains between Paris and Dijon from 6 am to Noon. Stations are listed in the left-hand column, spaced proportionately to the actual distance between them. Hours of the day march across the top. Each line on the graph is a train, with faster trains having steeper slopes. Lines running upward from the left represent trains approaching Paris. Lines leading downward to the right represent departing trains. This diagram shows the whereabouts of every passenger train on this portion of the line at any given time! It provides a superb basis for the Phantom Layout timetable of our railroad. Suppose we are building a model of a terminal in Paris. We can read across the line beside Paris, and see immediately that we can expect arriving trains at 6:55, 8:15, 8:30, 11:20 and 11:50 AM. We will be dispatching trains from the terminal at 6:30, 6:50, 9:00 and 11:00 AM. Now we can easily make our terminal’s operating plan and see how it fits into the rest of the railway system. For more information and an excellent tutorial on building timetables for model railroads, see Mike Dodd’s wonderful website. It’s well worth a careful reading. Bob Hughes chose a more relaxed format to operate Sutton Road. He created a Sequential Timetable, where trains are assembled and dispatched or received in sequence, regardless of how much time is required. So no one ever gets behind or has the unnerving experience of being told they’re “holding up the entire division.” Bob provided us a sample sequence, with all moves written out in the order they’re to be performed. Included are such moves as freeing a newly-arrived locomotive to visit the service tracks, shunting empty coaches into available platforms for passengers to board, and the like. 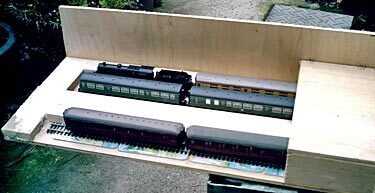 Bob’s illustrative sequence is reproduced below (platforms are numbered from back to front). 14. Station pilot (unseen) removes the coach from Platform 2. 15. DMU arrives on Platform 3, stopping short of the Baggage Car which is still there. These operations represent perhaps two scale hours of a day’s work at this busy model terminal. The photos below show candid shots of a similar operating session taken during layout construction. The sense of actually “running a railroad” is a delight, even before the scenery is in place! BREAKING NEWS: Today (1 Nov 2010) marks the premier of a new podcast, The Model Railway Show, a fast-moving and professionally-produced biweekly audio look at the State of the Hobby. The first show includes a brief interview with Carl Arendt about this website! You can hear Show #1 here.